March Selfie Finals Tonight at 6PM! Here are the final standings for the March Selfie Tournament! The top 8 players are invited to play in the finals tonight at 6 PM, it is 4 strikes format, 2 strikes given out per group. The tournament should last roughly 2-2.5 hours. Hope to see several of you there. Congrats to Matt Peace on winning the Monthly 4-Strikes tournament yesterday, and a big thank you to everyone who came out and played! League Night! 8:30 PM at North End Pub! Blink and here it is, week 3 of the league tonight at North End Pub! Get there by 8:30 to play tonight, and if you can’t make it don’t stress as there is always Make-Up Monday. I, unfortunately, won’t be able to attend tonight as I head to The Texas Pinball Festival in Dallas, but I will get you guys set up and playing before I ever board my flight! Monster Bash should be moved into the bar for tonight as well, and Goldeneye is still on Free Play. That and World Cup Soccer are both the selfie games so if you get a good score before or after league feel free to snap a picture and get it submitted to the tournament for the month. Good luck and see everyone on Monday! If you missed out on league action last Thursday get down to North End Pub tonight for Make-Up Monday! We will start a bit after 8 for anyone who needs to get their games in for week 2. Also, an important reminder that there is no tournament at North End Pub this Sunday, March 24th as it is Spring Break, the tournament has been rescheduled for March 31st! See everyone down there for some great pinball action! Lastly, check out our newest game to the location Goldeneye! The game will be on FREE PLAY for awhile so enjoy the amazing secret agent glory of James Bond. Thanks to everyone who came down and played last night! Hopefully, you all had a good time, sorry I got stuck doing repair work the whole time, I’ll be sure to play with people on Monday for Make-Up Monday night! If anyone else missed or you know of anyone still wanting to join send them down on Monday, we will play a bit after 8. 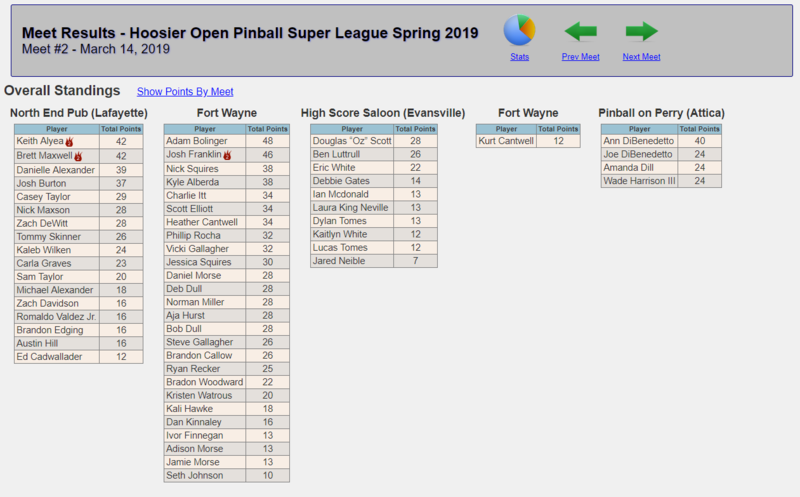 Here are the standings of not just our location, but of all the locations across the state that are participating in our Hoosier Open Pinball Super-League! Check out the site to see all sorts of cool data that we have already been able to generate after just the first two weeks. We still have locations in Northwest Indiana as well as Shelbyville that are going to be joining up in the next few weeks to added to the mix. Can’t wait to see how many people we have for this league! League night down at North End Pub! Come one, come all, down to North End Pub! Bring ye quarters and dollars. Drink the drinks, enjoy the foods, flip the games, have fun with friends! PINBALL FOR EVERYONE at North End Pub! Mark your calendars, Sunday, April 7th! The showcase of the immortals is taking place at North End Pub! This once a year event will coincide with WWE Wrestlemania. I’m putting the Indiana Matchplay Championship on the line! Taking place from 1 PM – 5 PM, battle against the greatest players from around the state in a group matchplay format tournament. 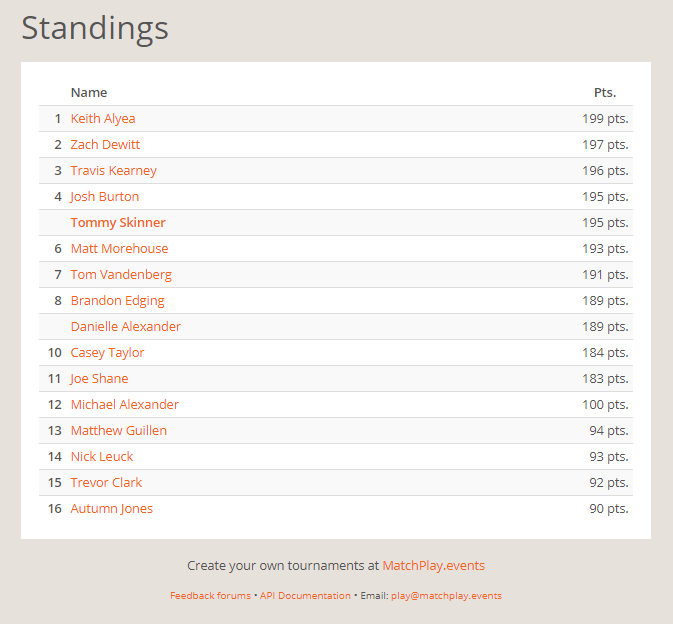 At the end of 4 hours, the person with the greatest point total will be lay claim to the Indiana Matchplay Championship! If any players are tied they will face off in a one-game tie-breaker on a random machine. Following the conclusion of the tournament get ready to watch “The Premier Sporting Event of the Year!”, Wrestlemania 35! Will it be Kofi-Mania? Will Daniel Bryan save the Earth and all of us with it? Can The Man be held down by the Rowdy one and The Queen? Will Drax, aka Dave Bautista, vanquish HHH from Wrestlemania once and for all? Roman Reigns beat cancer, but can he beat a giant Scotsman with a Claymore in Drew McIntyre? Will Seth Rollins finally burn down Brock Lesnar?! All these questions and many more will be answered that night. Oh, and did I almost forget to mention it’s a pot luck dinner celebration?! Bring a dish to share with everyone as we wine and dine as only Nature Boy would do on this special night! As always food and drinks available at the bar all day long!